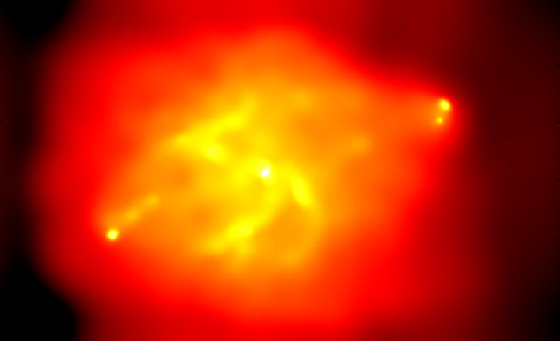 This Chandra image shows a giant football-shaped cavity (yellow/light orange inner region) within X-ray emitting hot gas surrounding the galaxy Cygnus A. The cavity in the hot gas has been created by two powerful jets emitted from the central black hole region in the nucleus of Cygnus A. 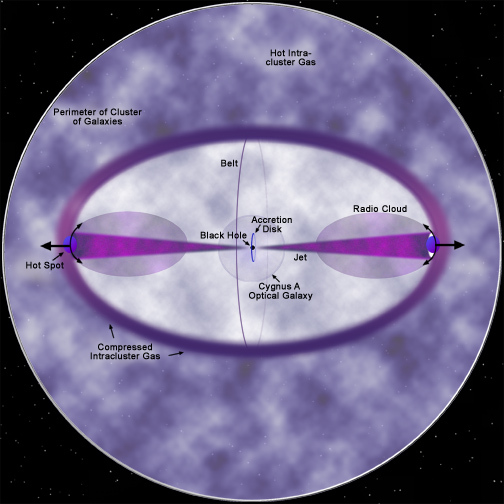 Hot gas is steadily being piled up around the cavity as it continuously expands, creating a bright rim of X-ray emission (bright orange outer area). Cygnus A is not alone in its galactic neighborhood, but is a member of a large cluster containing many galaxies. Extremely hot (tens of millions of degrees Celsius) gas is spread between the galaxies. Although it has a very low density, this gas provides enough resistance to slow down the outward advancement of the particle jets from Cygnus A. The jets themselves terminate in radio and X-ray emitting "hot spots" some 300,000 light years from the center of the galaxy. Scientists believe that fast atomic particles and magnetic fields from the jets spill out into the region, providing pressure that continuously inflates the cavity. Scale Image is 3.3 x 2 arcmin across. Coordinates (J2000) RA 19h 59m 28.30s | Dec +40° 44´ 02.00"